This was one of the biggest confusions I've ever had when booking a bus journey - Which bus? 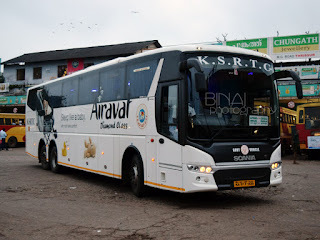 I was searching for a bus for a 250km ride from Thrissur/Ernakulam to Trivandrum. My only requirement was it should be an AC bus - I did not want to risk getting wet in a non-ac bus given the torrential rains in Kerala. I got some inputs, and I confused myself. I struck off KTC from my list - for the lack of a good boarding point and it was expensive as well (for the distance). I thought of trying the new ACC of KaSRTC running in the Mysore-TVM route, but it did not let me book tickets for Thrissur to Trivandrum. Later, I overran its reservation timing, and the bus did not appear on the booking portal when I logged in. As time ran short, I had not much option - so Kallada it was. Now came the next confusion - which service? They had buses at 0100, 0115, 0300 and 0345hrs from Thrissur. I took the 0100hrs service - chose a seat towards the back, and booked it online. Now comes the next problem. How do I reach Thrissur at 0100hrs! The last bus to Thrissur from my place goes at 2030hrs, and it takes only 65~75 minutes to reach Thrissur - So, I'd be there by 2145hrs, maximum!! My mom get the next option - call an auto. My dad called a regular auto guy, and arranged for a pick-up at 2330hrs. The auto guy came at the scheduled time - he had decked up his auto with tarpaulin sheets all around - so I wouldn't get wet. He loaded my bags, and we were ready to move - started off exactly at 2330hrs. It was raining - not heavily though. He did not speed much - since he was aware that my bus was only at 0100hrs. It was a Piaggio Ape rickshaw. I turned it to some music as we waded through semi-flooded roads. Rain picked up strength as we neared Thrissur - auto slowed down to prevent water splashing in. I was finally dropped at Kallada's office in Sakthan Nagar at 0020hrs - the auto guy ensured I did not get wet even when getting into the office - Sumesh, you rock! I am sure to call you the next time too. I just dumped my luggage near the entrance of the office, and walked in. Two staff were sitting there - one on the phone trying to manage a crossing, while the other was busy entering some records. There were no passengers in the office at that time. The guy who was writing the record checked my ticket, then went to their website to check the chart, found out the bus number and made a marking on my ticket - "KA 01 AB 0154". Oh! So its the regular bus today - I was expecting a rotation and some other bus to turn up - doesn't matter since I haven't travelled in 154 as well. There is a TV in the office and a Malayalam movie was being played - I spent time watching that movie. Around 0045hrs, another passenger for the same bus turned up. All this time I hadn't noticed that my ticket actually showed 0100hrs as the reporting time and 0115hrs as departure time! Two Bangalore-Trivandrum B9Rs come at the same time - one comes via Coimbatore (the one in which I had booked) and another comes via Mysore. The clock ticked past 0100hrs, but there was no sign of my bus - the guy in the office then announced that my bus was past Kuthiran, and should reach in another 20 minutes. 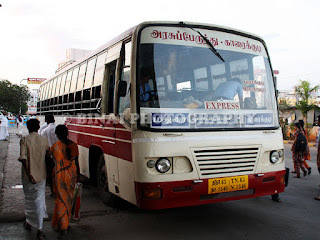 He called up the driver at 0115hrs, and found that the bus was at Mannuthy then - he reminded him about the pickup here. The bus finally turned up at 0123hrs - it was indeed KA-01-AB-0154. The bus was stopped right outside the office - I headed to the bus, and directly headed to my seat - J1. I somehow always book rows I, J or K in Kallada - those are rows 9, 10 and 11. I noticed that my adjacent seat was vacant as well, and the bus had quite some empty seats (14 seats empty according to the chart). I had the temptation to the head to the last row and sleep - but decided to stick to my seat itself. The bus started off at 0130hrs. For some reason, the lights inside weren't switched off - but it was the standard covered type, so too little little actually came in. The bus: KA-01-AB-0154, parked in TVM. The driver was pretty quick - he maintained decent speeds till Thalore, and then let the beast rip for sometime on the four-laned section. I slept off for some time. I made full use of the double seat. The bus stopped at Ankamaly (outside KSRTC BS) to drop a passenger (0209hrs), and then continued. 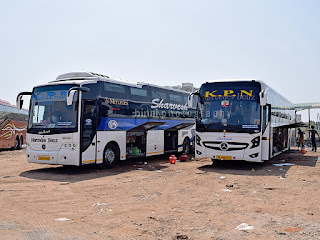 Due to the sheer number of checking points, Kallada buses do not pick passengers from the road side (atleast on major routes), and hence does not waste time scouting for last moment hitch-hikers. I had another nap, and woke up when the bus stopped at Vyttila (0240hrs) - quite some passengers got off. We stopped at two places in Vyttila - first just past the signal, then again near the Kallada office. We finally left Vyttila at 0249hrs. Thrissur to Vyttila in 1h10m - not bad, not great either. Its a 73km distance. I slept again after Vyttila. This time the sleep wasn't continuous - since the bus hit quite some bad patches. The driving was sane - I wasn't woken up by rash braking anytime. I woke up as the bus stopped in Kollam (I think it was near Chinnakkada - not sure) - at 0502hrs. We did not move for some time (guess some luggage was being unloaded, since I could hear the luggage door being closed). We started off at 0505hrs. Our scheduled arrival in Trivandrum was 0500hrs (a tough target). I slept off again - remember stopping at Attingal (0549hrs). The bus stopped at Kazhakkottam (did not notice timings) - we took the route via Pattom instead of going via Chakka bypass. The bus made multiple stops at many places, like Ulloor, etc. I was finally dropped at Aristo Junction, Thampanoor (Trivandrum) exactly at 0627hrs - 4h57m from Thrissur to Trivandrum. End Notes: The bus was KA-01-AB-0154, delivered in end of 2011. I did not notice the odo reading, but it should be around 4lakhs. This particular bus (and its pair, 0153) runs almost non-stop for most of the time, getting rotated between routes as well. Despite the continuous running, the bus appeared well kept. There was some noise coming from one of the rear tyres at slow speeds, but no issues with the suspension set-up. The interiors were clean and well-kept. The driving was good - no rash cuts or rash braking, and absolutely zero use of horn. The running time of 4h57m is quite good for the distance (my last journey in KTC covered the distance 30minutes faster - but that was quite rash). Blankets were available - they were left on the seat - the used ones weren't cleared out though. Will I take this service again? 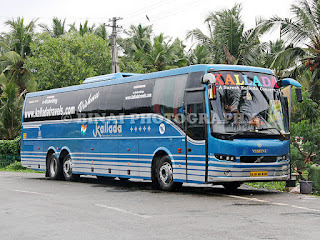 Its an amazing option for Thrissur-Trivandrum rides - the odd departure time is a worry though. Recommended! Did the bus reaIly went at higher speeds after Thalore? l heard that now they are cautious & drive@ 80 Kmph only? PS : Why no rail journeys now?? Unrelated to this specific post - I enjoy reading your blog and your posts on bcmtouring.com. They gave me a new perspective on the whole bus travel industry. Keep the good work going.